Jackie is a recovering alcoholic moving into Havenhurst, an apartment complex in New York City run by Eleanor Mudgett and her son Ezra, who also serves as the building's maintenance man. Jackie is warned that she must remain sober while living in Havenhurst or she will be swiftly evicted. 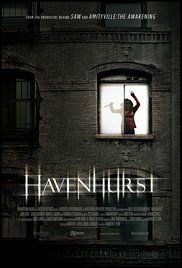 Jackie begins looking for evidence about a previous Havenhurst tenant and personal friend, Danielle, unaware that she was brutally murdered along with her addict boyfriend shortly after receiving an eviction notice. She also meets some of the building's residents, notably a young teen named Sarah, who lives with her foster parents Tammy and Wayne (Wayne being an abusive alcoholic). Some time after moving in, Jackie hears a neighbor, Paula, murdered because she returned to prostitution. Danielle reports the incident to a detective friend, Tim. Read more on Wikipedia.